Ceilidh Minogue is Scotland’s Favourite ceilidh band. Ceilidh Minogue Scotland’s Favourite ceilidh band. With one of the most mischievous band names around. This is one of the very few ‘full-time’ professional ceilidh bands working in Scotland today. The band played ‘live’ for the seventh year running on BBC Radio Scotland’s Hogmanay Show in 2015. The band also performed at Glasgow 2014 Commonwealth Games. 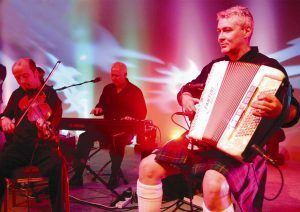 The Ceilidh Minogue band was originally y formed in 1995 by a bunch of like-minded musicians from the Stirling area for a one-off charity night. Originally called ‘Ceilidh Minogue and the Cajun Hormones’, the Hormones were dropped, a few personnel changes took place and the band became known as Ceilidh Minogue. In 2002, Gavin replaced Marianne Campbell on fiddle and the present line-up has remained since then. The band has played in all the top venues like ‘Gleneagles Hotel’, ‘Dunkeld Hilton’, ‘Roman Camp Hotel’, ‘The Old Course Hotel’, ‘Marcliffe Hotel’, ‘Dalhousie Castle’, ‘Oxenfoord Castle’, ‘Balbirnie House’, ‘Dundas Castle’, ‘Caledonian Hotel’, ‘Balmoral Hotel’, ‘Drumossie Hotel’ etc…. Clients have included:- BBC, STV, Visit Scotland, B.P., Shell UK, Illico Events, Real Radio, Academia, Clydesdale Bank, Deutchebank, G.A. , Life Span, Diageo UK, Ideas Unlimited, Moray Ceilidh Club, Barclaycard, etc….. The band appeared in BBC’s ‘Monarch of the Glen’ broadcast autumn 2004 and Gregor & Pete were also in a fishing scene!! We did ITVs ‘Heartless’ in the spring of 2005 featuring Angus Deayton and the music of Ceilidh Minogue. Our albums have been played in radio stations all over the world and featured by the BBC on ‘The Reel Blend’. The band also has £10m Public Liability Insurance and the electrical equipment is fully PAT tested.